After a few weeks of not seeing my car I couldn’t wait to get down to see the guys at Mustang Maniac. Friday night arrived as soon as I got home from work I went out to the man cave and packed what I thought I would need. I had a rough idea and so I packed brushes gloves and the change of clothes. I was up and about, dressed, fed and ready to go by half eight in the morning. The trip was pleasant and I had the added bonus of seeing some classic cars going to where ever the show was. I spotted a couple of Mustangs, a GTO, couple of old Chevys, a few old trucks, a Charger, Stags and even an E-Type Jag etc. Seeing all those lovely old cars just made me squeeze the gas a little more to get there a bit quicker. Once I arrived I was greeted by a pack of dogs that must have forgotten who I was. Adam greeted me and we had a chat to catch up with all that has been going on with Mustang Maniac and my car. We walked in and it was one of those OMG moments and I was speechless, those that know me will realise that is a rarity. The back of the car has been rebuilt! The left quarter has been taken off and roughly aligned. The right has been prepped ready for removal and the replacement parts all lined up. The quarter will not be welded up just yet until the trunk has been finished and the outer wheel arch has been fitted correctly. The trunk panel was a little thin on the main panel where the curves meet the fuel tank which I knew about, and thought I might get away with. The guys decided it was a little to far gone to save. The replacement panel they were going to use had angled fittings to it rather than the gentle curves it should be, so they were not happy with the part and rejected. As a result the guys unpicked another part to get the curved panel and weld that into place from the previously cut away section. 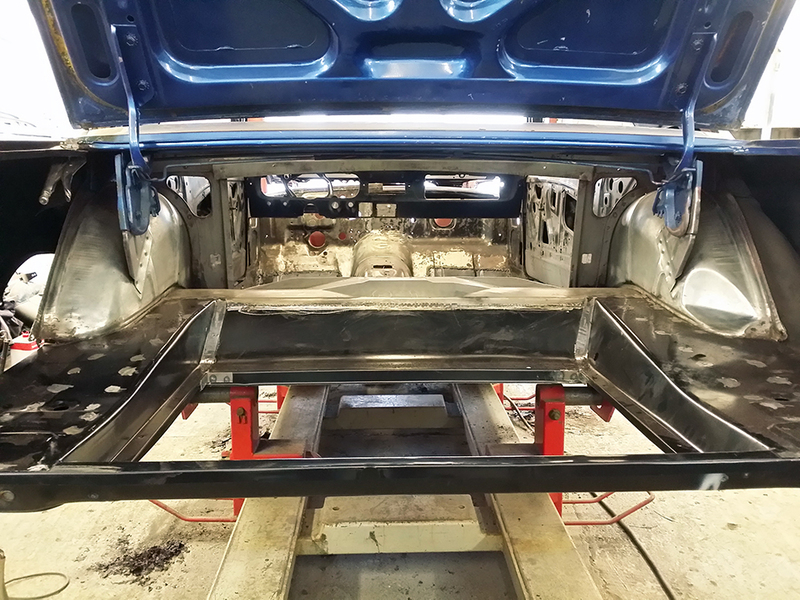 Terry has done a brilliant job of reconstructing the trunk and has added the trunk flooring both sides on top of the chassis legs and the side drop off panels too. The welding has been ground down and doesn’t show at all, impressive stuff as always. The trunk is not fully finished yet, but it’s looking pretty damn good. Once I had caught my breath back I asked what need to be done. Adam told me to remove the paint from the visible trunk area ready for primer and the car colour, that consisted of the inner wheel arches and the drop down main panel which goes over the shock fitting holes and into the back of the car behind the seat. I had guessed right with what I needed, gloves on and stripper poured ready for use. To do this bit of work I climbed under the car into the trunk and worked from there. The usual story, stripper, scrape, stripper, coarse wire wool and thinners to clean it all up. The end result was pretty good as there was no filler in place at all which was a major bonus. It did uncover a couple of little sections what will require a few spot welds and little plate inserted, nothing major or structural. That leaves the overall view of the trunk which is amazing at this point. The front of the car is also being worked on quite heavily, but I will get the full pictures before and after next week. I have been spoilt and so has my car. Thanks guys. I ached all over on Saturday evening bending in weird positions to remove the old paint. Sunday I visited an old friend which was just as well as I was still aching not that I got any sympathy mind you. Monday being a bank holiday in the UK gave me an extra day to finish up in the man cave. The task was to reassemble the steering section back together. I applied a very fine dusting of clear lacquer to the silver and allowed it to dry. Once the final layer of paint had dried I carefully removed the masking tape and the plastic carrier bags to get the overall effect of the paint work which I think works quite well. Of course nobody will see it but hey, I know it’s there. The pipe work was refitted back to the relevant points, but none of the fittings have been done up tight yet. The reason for that is just in case some of the pipes have to be moved around when its all refitted back up together again. Just for comparison if you didn’t catch the original condition. A bit of a large update, but I think it was worth it, me – I am ecstatic with the work. This entry was posted in Car, Photo's and tagged fabricated, Mustang, Onemanandhismustang, paint, panel, rear quarter panels, steering, steering ram, trunk. Bookmark the permalink. Thanks Dana. It gives me a nice buzz when it comes out well like that. Funnily enough we thought of you over the weekend when we were driving along the M62 and saw a whole load of American cars heading East (I think there was a car show on somewhere) and amongst the cars was a stunning champagne gold Mustang. I’m not that up on Mustang models but it looked to be a coupe like yours. Fantastic work going on at Mustang Maniac. Are they the only place specialising in Mustangs or did you choose them due to their proximity or reputation? or actually did you choose a Mustang because of their proximity? I have always fancied an American muscle car but have been put off by the seeming lack of specialists near me. As I can’t weld to save my life I would want to entrust that to somebody like your MM team. I assume they don’t come cheap though! Hi, I still haven’t found out what the car show was but I went passed a few and gave them the thumbs up as you do. Like you say I saw a flat backed Land Rover and wondered if you were going! Great minds and all that. I assume there were quite a few car shows on over the bank holiday weekend as it is unlikely we witnessed cars going to the same show. Must have been a sizable American car show up by us as we saw dozens of them on the motorway including a huge bright red 50’s era Chevy Bel Air as well as numerous customised pickup trucks. I didn’t realise MM were that far from you. I understand now why you aren’t there every day!